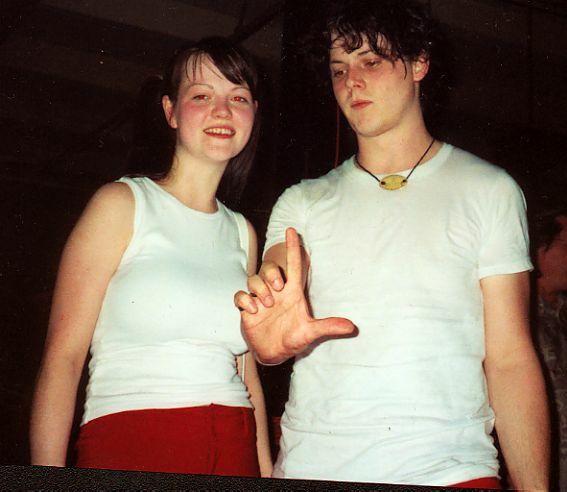 SMASHIN' TRANSISTORS: WHITE STRIPES "Classic Smashin' Transistors Interview"
WHITE STRIPES "Classic Smashin' Transistors Interview"
Lucas: Has the the Monkey stopped jumping on the bed? Jack White: No, The monkey "Jimmy" has not stopped jumping on the bed for the last week but when he does it is only so that he can explode things that are not the color red. It is Jimmy's only power. Lucas: What color is the school bus? Jack White: The bus on "Sister Do You Know My Name" is blue. Lucas: Do you like bowling? Jack White: Yes, I like bowling very much. I have sung about bowling or bowling alleys in the White Stripes songs "Red Bowling Ball Ruth" and "Handsprings"
Lucas:...Did you have to wear good clothes on Easter? Jack White: Actually, I wore a blue suit on Easter when Jesus rose from the dead. Jimmy the exploder hates the color blue and anything that is not red and has the power to explode those things with his mind. Lucas: If Jimmy the monkey wear to wear a shirt that was not the color red would he then try to explode himself? Jack White: Jimmy only wears his pair of red overalls and nothing else. Lucas: Does Jimmy not eat banana's because they are yellow or does he eat those fancy red ones? Jack White: Jimmy is the only monkey that lives off of an exclusive diet of red apples. Lucas:Okay, the bus on "Sister, Do You Know My Name" is blue but what about the bus from the "Pack It Up" song? Jack White: The bus on "I'm Bound To Pack It Up" is grey. He's not so sure that he wants to leave. Lucas: When the boy broke a couple of rules so that the girl would notice him-what did he do? They make you sit on the bus when it is moving. Did he get in trouble? Jack White: He breaks the rules just by getting in trouble with the nuns who teach at his school. Lucas: Do fifth graders like you get sad on the last day of school because you wont see some of your friends until the fall? Jack White: On the last day of school as a boy I would go outside and kiss the ground like the pope does when he lands in a new country but all the other kids didn't know about the pope doing that so they would make fun of me. Lucas: If you were to take Jimmy the Monkey to the lake would he try to explode it because it's blue? Jack White:I'm not sure what Jimmy would do if we took him to the lake. He would probably drink the water, you have to remember he only explodes things that aren't red WHEN HE WANTS TO. Lucas: How far have you ever flown on a plane? What was it like? Jack White: The farthest I've flown is Australia. It takes a long, long time to get there but it's so nice when you finally land. Lucas: Australia?! Woah! That would be pretty cool! Did you see any kangaroos or wombats? tazmanian devil which looks like some kind of pig-dog. All at the zoo in Melbourne. Lucas: Do you have a favorite song by the Coasters? Jack White: My favorite Coasters song is "Riot In Cell Block #9." Lucas: "White Blood Cells"...why such a crazy name and why are those shadow people bothering you on the front cover? Jack White: The shadow-people might be bactria coming at us and Meg and I are the white blood cells. Or maybe it means white blood "sells" and the bacteria are media and music lovers...or maybe it means nothing at all. Jack White: Well, Toledo has been that sought after destination point. People don't exactly go on vacation there. The girl in the song was sending me to do things for her, like run an errand to Toledo, which probably wouldn't be fun. Lucas: If there is no true love...how did you fall in love with a girl? Lucas: On the back cover (of "White Blood Cells") are you in red because you are standing in the water and are you helping Meg across because she's in white and standing on the dirty ground? Jack White: Perhaps on the back cover Meg and I are blood cells...or perhaps she is on the dirty ground and I am in happiness...or perhaps I'm dragging her into a place she doesn't want to be or maybe she's pulling me out of it. Lucas: Where you thinking of monsters like Godzilla when you sang "Aluminum?" Jack White: "Aluminum" is about the formation of aluminum in a factory. That is what the voices are try to imitate. Lucas: What's your favorite building (besides your house) in Detroit? Jack White: My favorite building in Detroit is the Manoogian Mansion where the mayor lives. Lucas: Have you ever rode the People Mover? I did with my dad but I didn't see any other people on it. Jack White: Yes, I rode the People Mover the first week it was running and it took me back where I started riding it. Someone told me they bought it from Cedar point because nobody would ride it over there. Lucas: Do you ever let Jimmy the Monkey do the Astro? Can I do it? how do you do it? Jack White: The Astro is whatever you do in secret that nobody knows about. Everybody does the Astro. Jimmy does the Astro. Lucas: Did you have a favorite bike? What color was it? Jack White: I had a pair of matching ten speed bikes that were dark red and they were Schwinns. I rode them all over this town on them but one of the few times I cried over a possession was when both of them were stolen. Lucas: December?! It's cold but it's Christmas Time. Why be worried? Jack White: December can be good or bad can't it? That goes for any month, day or year. Lucas: My dad is showing me some guitar chords. The first one was the E. He told me all rock and rollers learn it first. Even Jack White? Jack White: Yes, the E chord was the first chord I learned but my favorite is F because it is as low as you can go, without being E.
Jack White: I think you're absolutely right about the big room. You're a pretty smart kid. It took me years to figure that out. Sad to see all that stuff disappear as it was very entertaining. Any way to keep it up as an archive? I've had a few people offer donations to keep it up for another year so I can fully import (or at least back up all the stuff that is in there) but I don't know how serious they are. It takes $100 a year to keep it up and I just got invoiced the bill for this year last week and a notification that it would be suspended if I could not pay it. Not that $100 is a lot but I gotta watch all my nickels and dimes lately. I guess IF people really want to throw me some coin to keep it up for another year (where I can work on saving/moving EVERYTHING from it piece by piece) they can make donations via paypal to smashintransistors@yahoo.com.